Dragon Boat racing is growing in popularity in the U.S., but its roots go back millennia to the other side of the world. Dragon Boat festivals have been around for more than two millennia. They are traditionally held on the fifth day of the fifth month of the lunar calendar, to commemorate the death of Qu Yuan, a legendary hero and poet, who, according to ancient Chinese folklore, jumped into a river during the Zhou Dynasty. The locals cared greatly about him, so they rushed onto boats in an attempt to rescue him. They beat drums to scare the fish away from his body and threw rice dumplings into the water to prevent the fish from eating him. The reenactment of this event gradually evolved into the dragon boat races and festivals we know today. 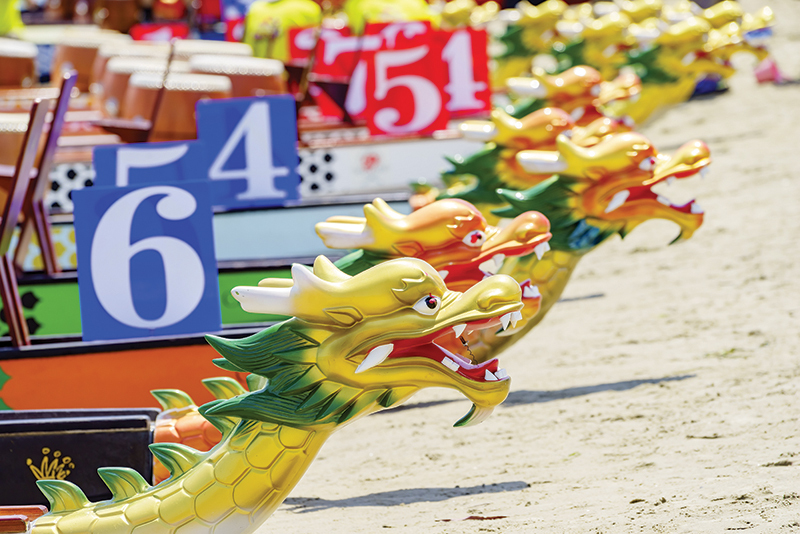 Dragon boat racing in modern times encourages teamwork, and California is home to several dragon boat festivals that are fun for the whole family. The largest race in California is held in the Bay Area. Organized by the California Dragon Boat Association at Lake Merritt in Oakland, the Northern California International Dragon Boat Festival pits 40-foot dragon boats against one another in races all weekend at an admission-free event full of fun activities and spectacles everyone will enjoy. Scheduled for Sept. 23–24 this year, the event will include multicultural shows both days of the festival, including traditional dances, magic shows, taiko drumming, hip hop dances and Chinese acrobats. The San Diego Dragon Boat Race is held on Mission Bay each year in the fall. This year’s race, sure to include colorful boats, camaraderie, vendor booths, food and more, is Sept. 30–Oct. 1. The main traditions associated with dragon boat racing, besides the actual racing, include eating rice dumplings, which are filled with assorted meats or eggs and wrapped in banana leaves, and balancing raw eggs so they stand upright. It is thought that the Earth’s gravitational pull is at its strongest at noon on the fifth day of the fifth month according to the lunar calendar, so it’s possible to balance eggs this way (so the events around the state this fall might not be the best for egg balancing). Folks who balance the egg at noon are said to have earned good luck for the year. Families in China also hang up mugwort plants to deter pests and disease from entering their home. Here in the U.S., many marinas and lakes all around the country host dragon boat races year round. There is a race for all skill levels, from beginner squads to advanced world championship teams. The races attract hundreds of thousands of visitors who come for the races and stay for the celebration of cultural heritage through music, dancing, drums, martial arts, songs and always an abundance of Asian food. Local community organizations, high school groups and businesses often create teams and participate in the races. Paddlers in training learn strength, endurance, form, mental focus and, most importantly, timing. A conditioned team of paddlers has nearly perfect synchronization in their paddling. Dragon boat festivals have become great community relationship builders with many groups coming together to have fun and enjoy Chinese culture, ancient and contemporary. Modern dragon boat races can be quite competitive, according to Andi Liskay, president of the San Diego Dragon Boats. Each crew is composed of 22 people — 20 paddlers, one drummer, and one steerperson — and each crew races against the other crews for time. Based on each crew’s times, they will advance to various divisions to compete against other crews that have similar times. Basically, there is a Division A (top crews) and a Division B for recreational crews. Some festivals have more divisions. There are competitive and recreational teams throughout California. Local teams are often looking for team members, for anyone who is interested in trying it. Dragon boat paddlers are about community and will always help newbies get on the water with a team. The type of folks who normally gravitate to dragon boat racing tend to be people who like watersports and competition, but just about anyone can participate. People of any age can paddle a dragon boat — usually from 12 years old up to 80 years young. The activity’s popularity has grown in the United States, because of its universal appeal — a great full-body workout, competitions all over the world and the lifelong friendships formed with teammates.